We recently got an opportunity to review The Asian Kitchen - Fabulous Recipes from Every Corner of Asia by Kong Foong Ling, a cookbook packed with recipes from the many fabulous cuisines of Asia. 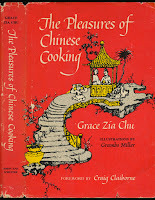 Not only recipes from Burma, China, India, Indonesia, Korea, Japan, Malaysia, Singapore, the Philippines, Sri Lanka, Thailand and Vietnam, but also packed with interesting introductions into the food culture of each country, suggestions for planning meals and a handy pictionary of the more exotic food items and kitchen utensils required for the recipes. I have to admit that at first I was not sure how to go about this review, there was so many recipes to look at! But then once I had settled into my comfy chair with the cookbook I found myself quickly lost in the delights of the specialities of each cuisine. As I'm sure many of you have, my family and I have traveled here and there in Asia and we have delighted in good food wherever we found it. Fond memories of yummilicious foods that we had eaten in distant lands danced through my mind as I turned the pages. But what recipe to review? I wanted to make everything at first but finally decided on a smorgasbord of Asian Hot Chili Oil Sauces. What could better showcase the similar yet unique variations that are celebrated by The Asian Kitchen? The Chinese Chili Oil hot sauce was super easy to make. Just dried chilies, Sichuan pepper, and oil. My 老公 pronounced it as quite spicy with a delightful 'flowery' aroma that lingered in your mouth. Click here for the recipe for Chinese Chili Oil. The second chili hot oil sauce we made from The Asian Kitchen cookbook was the Shrimp Chili Paste from Thailand. This chili paste had the most ingredients and was comparatively more complicated to make. I had to search around for palm sugar and tamarind, which I eventually found stocked by Thai food shops. (I went to the wet market for these specialty Thai food shops.) This chili paste uses a lot of dried shrimp which is ground up and provides a lovely chewy texture quite like that found in your standard XO sauce. The Shrimp Chili Paste is not hard to make, you just have to cook everything together to bring out the flavors and then once it is cooled down, grind it up. The only other technical step would be the making the tamarind juice if you can't find actual tamarind juice. I happened to have a packet of dried tamarind fruit which I bought probably 5 years ago (and it's still good would you believe!?) Scoop out a good 1 1/2 tbsps of the dried fruit, plonk it in a strainer and let it soak in 2 tbsp of warm water. Once softened use a spoon to push through the the fruit, leaving behind any fibers and seeds. You should end up with 1 1/4 to 1 1/2 tbsp of tamarind juice, easy peasey and just enough for this recipe. My 老公, official chili oil taste tester par excellence, persuaded me to try this one as it is not to spicy hot and I loved it! (I prefer the aroma of chilies, not the heat.) A lot of wonderful exotic flavors like dried shrimp, garlic, fish sauce, tamarind, etc., married together for a merry taste explosion and a great texture that adds a sparkle and a pop to your dish. This is exactly the kind of hot sauce that I like. This hot chili oil sauce goes yummilicious on a bowl of noodles! Click here for the recipe for Shrimp Chili Paste from Thailand. The last chili oil hot sauce that we made from The Asian Kitchen cookbook was the Sambal Trasi -Chili Sauce with Dried Shrimp Paste from Indonesia. Fascinatingly it uses shrimp paste in the hot sauce, yes, that extremely smelly, stinky, grey delicacy from the seas. Shrimp paste is basically salted shrimp fermented in the sun to a grey stinky delicious paste or block. Shrimp paste is a, ummm, rather an acquired taste if you're not used to it. We'd never seen hot sauce like this before, we've cooked with shrimp paste aplenty (see our Steamed Shrimp Paste Squid 蝦醬蒸鮮魷 recipe), but have never seen it in hot sauce. The Sambal Trasi doesn't need to be cooked, rather it is just grinded together to a paste. And it uses fresh chilies which makes this sauce strong flavoured and hot, hot, hot! We were not at first sure how to use this pungent sauce. Then my 老公 had an idea and stir fried some water spinach, also known as Tong Choi 通菜, with the Sambal Trasi - Chili Sauce with Dried Shrimp Paste. Wonderful! The sauce provided salt and flavor layers to the tender but bland vegetables while the heat was muted to a delicious highlight. Yum! Click here for the recipe for Sambal Trasi -Chili Sauce with Dried Shrimp Paste from Indonesia. Final Verdict: The Asian Kitchen- Fabulous Recipes from Every Corner of Asia cookbook really hits the spot with the greatest hits of each Asian cuisine, with appetizers, sauces, soups, mains, and desserts all covered with plenty of really gorgeous food photos. It also gives you a lot of fun and useful information on food history and background in each country. I found myself immediately longing to cook this and that and those and more! It doesn't go into great detail for any one cuisine, but if you want a cookbook that covers the basics of most of the Asian cuisines with gorgeous photos to boot, or just enjoy cooking across the Asian continent, then this is the cookbook for you! I know that we are enjoying it! GIVEAWAY DETAILS: We've got two copies of the beautiful cookbook The Asian Kitchen - Fabulous Recipes from Every Corner of Asia to give away!